This week, I have been busy entertaining some grandchildren. Two little great grands were here for a visit, along with two granddaughters. 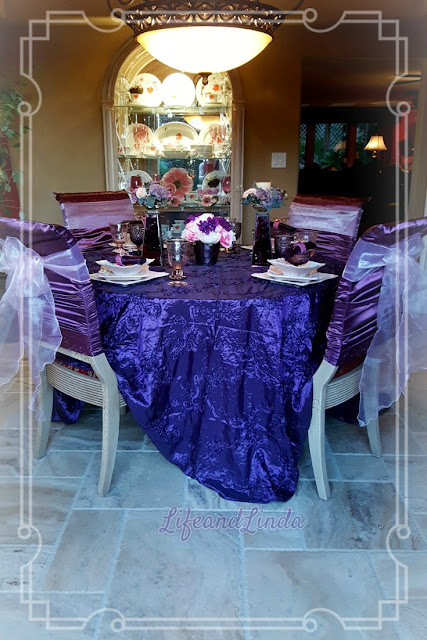 I did manage to create another tablescape with plums and pinks. Monday, I have a post about Google's Friend Connect gadget. Now let me turn it over to this week's host! Hello everyone! 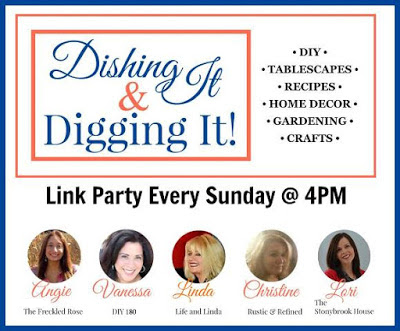 Welcome to Dishing It & Digging It! We are so excited to see what you've been up to this week. In August, gardens are lush and full of beautifully vibrant blooms. We wouldn't be able to sit back and enjoy this if it weren't for the help of our pollinators. Check out my review on The Hive Box below, that helps support these winged workers with bee-friendly products. Thanks for hosting, Linda. What great features. I can't wait to visit the link ups. Hi Linda! Thanks for the party once again. Hope you've had a great weekend! Always fun when we get to party together. Hi Linda and thank you for hosting your fun party! I love the features too. Thanks for hosting, Linda. Lots to see in this party. I'm off to visit. Good morning Linda! I still can't believe you are a great grandmother. I just can't! And your pretty plum décor is perfect as an in between season such as late summer. Glorious! So happy to be here and thank you so much! Hi Linda, will try and link up sorry I'm late. I bet you had the best time with your Grands! Thanks for hosting!